Named after the admired Hindu sage Visvamitra, Visvamitrasana is an intricate yoga pose acting as equal parts arm balance, hamstring stretch, and hip opener. With many complex components coming together in this beautiful pose, it can take some time and training to master. 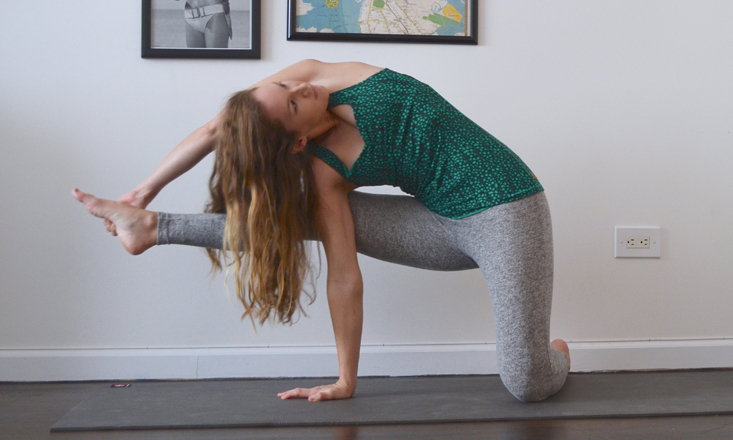 Below, we’ve broken down the key steps to achieving the fullest expression of Visvamitrasana. Opening the hips, shoulders, and chest, extended side angle pose lines up the body for the eventual master pose, Visvamitrasana. Extended Side Angle is a common pose in yoga classes and will help strengthen the legs and hips which are key to the final pose. Tip: From the blade of the back foot extend and reach the fingertips of the top arm forward, stretching the side body. Then, rotate the chest towards the ceiling to provide a deeper opening. Modification: If the bottom hand cannot reach the ground, try placing a block beneath the lowered hand to shorten the distance and impact of stretch. 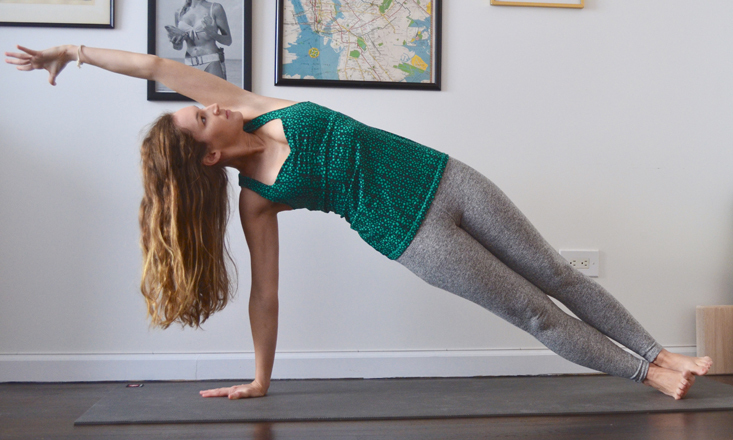 Also named after a sage (Vasistha), Side Plank pose (Vasisthasana) tones the entire body while stretching the side-body which will be activated in Visvamitrasana. This balancing pose challenges the body in maintaining a neutral spine acting against gravity. Tip: Engage the abdominals and quadriceps trying to find a neutral point for the hips (not too high, not to low). Think Tadasana pose turned sideways. Modification: If there’s too much stress on the shoulders, bring the bottom leg down to a 90-degree angle, resting on the shin. Intense hamstring and side-body stretch, Revolved Head-to-Knee pose (Parivrtta Janu Sirsasana) is just as much a doozy to execute as it is to say. The pose requires rotation of the chest and open shoulders like in Visvamitrasana, while passively lengthening the back and gluteal muscles. Tip: Remember to keep the sit bones grounded in order to maintain the angle and alignment of side bending. Modification: If the top hand cannot reach the extended foot, use a strap to facilitate the pose. In Compass pose (Parivrtta Surya Yantrasana), the upper half of the body is almost in the same stance as it should be in Visvamitrasana. So naturally, practicing this pose will prepare the body, namely the shoulder girdle, spine, and hamstrings for the more advanced postures. Tip: Shimmy the soon-to-be extended leg as far up the lower arm as possible before straightening. Use the lower hand as a kickstand gently supporting the weight of the body, and flex the feet to avoid rolling in the ankles. Modification: Again, feel free to use a strap/belt if the pose isn’t quite within grasp (literally). Keep lifting upwards to avoid collapse within the trunk of the body. Fusing all of the preparatory poses thus far, Ardha Visvamitrasana pose incorporates aspects of an arm balance, hamstring stretch, twist, hip opener and shoulder opener. Halfway to Visvamitrasana as the name suggests (ardha = half), this pose is modified by keeping one shin grounded. Tip: Press the lifted leg and associated arm into one another to stabilize the posture. Swivel the chest open towards to ceiling and gaze upwards. Modification: Place a block under the grounded hand to prop the torso a bit higher—this will decrease the intensity of the side stretch and make the pose more assessable. Visvamitrasana is no doubt a difficult pose—even some of its preparatory poses may seem challenging. But once you get the hang of the above postures, Visvamitrasana will flow easily into your yoga repertoire. Remember to engage the leg of the grounded foot, extend through the side-body, and flex the raised foot. It also helps to keep reaching the scapula towards the midline to assist a deeper opening through the chest and a fuller twist through the spine. Not limited to physicality, Visvamitrasana also requires some sage-like willpower, demanding a unique balance of effort and focus. So like a sage, be thoughtful throughout the process, learn from your experiences, and keep practicing.